You are here: Home / Nutrition / Eggs… Incredible?… Edible? You’ve read the news and now it seems that many are avoiding this food. You need to know that all eggs are NOT created equal! There are questions that need to be answered. How was the chicken raised? Most commercial chicken and egg facilities have thousands of chickens kept in a single building. They don’t even see the light of day! Many of these huge production operations are quite reluctant to allow their facilities to be video-taped because it is so upsetting for people to see. The possibility of disease is so rampant under these living conditions that chickens are given antibiotics. Conditions such as these are quite stressful to the chickens making the chicken meat and the eggs subpar in nutritional value. Commercially raised chickens are fed food treated with hormones. The hormones fatten them up and mature them as quickly as possible. 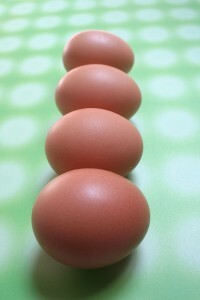 The faster the time from egg to chicken to market, the more profit for the producer. Organic chicken and eggs are much more nutritious! Start with chickens that are allowed to roam and mingle. To pick and forage for their food. When they are raised under these natural conditions they are healthier and provide those higher on the food chain (including us) with healthy nutritious eggs. Eggs delivered in this fashion are one of Mother Nature’s perfect foods. So, now you know! Yes, eggs are incredible and certainly edible! So remember, know how the chicken was raised and what it was fed. Enjoy!